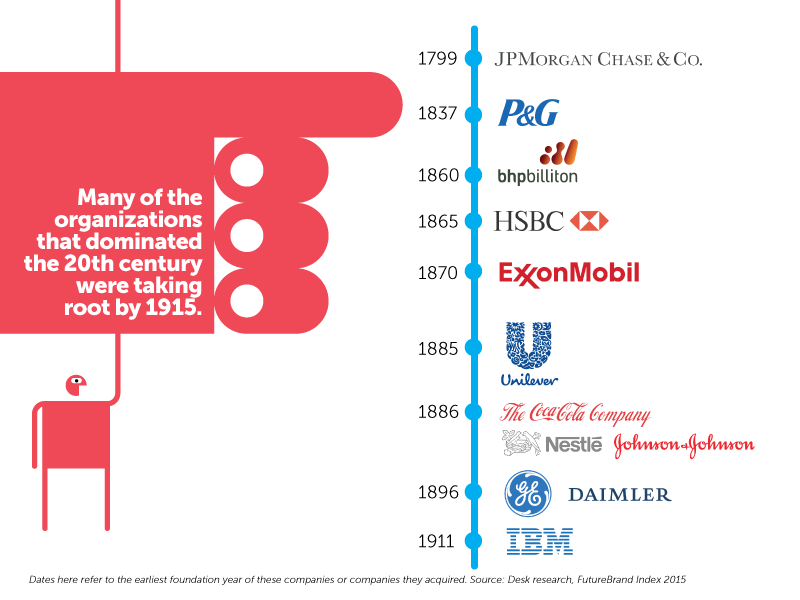 Many of the organizations that dominated the 20th century were taking root by 1915. The foundations of what we now know as BHP Billiton, Coca Cola, Daimler, Exxon Mobil, General Electric, GSK, HSBC, IBM, J&J, JP Morgan P&G, Nestle, and Unilever already existed in one form or another. Others like Boeing, Novo Nordisk and Walt Disney were not far behind in the next decade. Their power reflects a century characterised by American and European globalisation of industrial technology, healthcare, energy, financial services, entertainment and consumer goods. And many of these are still dominant today – in terms of their reach into our lives and their financial size – because the innovations powering their growth and relevance are still important: from computing to domestic refrigeration, medicines for chronic diseases, affordable cars and energy, access to money and everyday consumer products. At the root of this dominance was their capacity to master the natural environment: to tame the world around us with feats of engineering, exploration, industrialisation, quality assurance, consistency, reliability and distribution and make the benefits mainstream. From the jet engines that carried us to new continents, to the familiar drinks in restaurants when we arrived there, these companies became household names by providing certainty in an uncertain world. But the world has changed over the last two decades. As new forces in science, economics, society and technology begin to shape our preoccupations, many of these organizations are fading in perception strength relative to a new peer group. This year’s FutureBrand Index research confirms trends in perception strength that started emerging in 2014. Fifteen years into this century, well-informed professional people around the world are preoccupied with organizations at the forefront of digital technology, biotech, the collaborative economy and Chinese globalisation, not just because they are growing stocks, but because of the transformational impact they are having and will continue to have on our lives in the future. This continues to include some of the world’s most established corporations, the strongest of which have adapted to the changing environment. 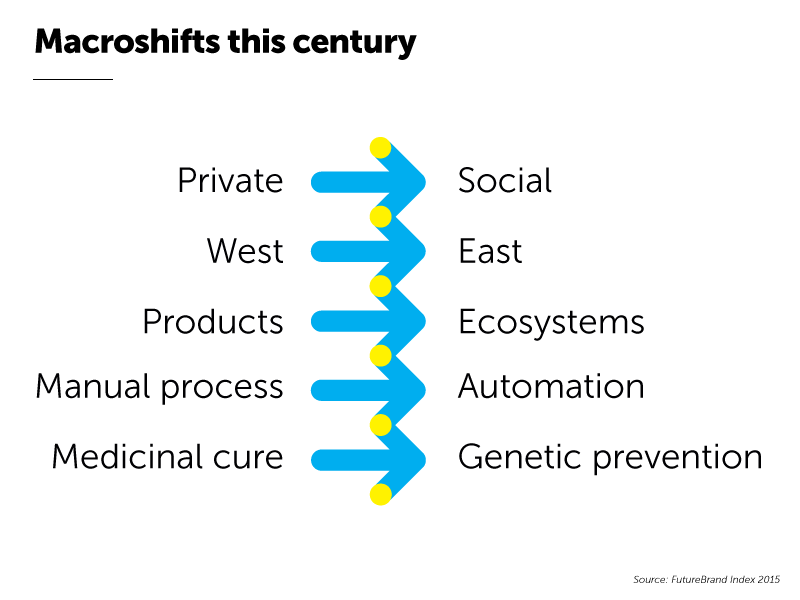 But is increasingly dominated by relatively new companies – from Alibaba to Gilead and Tencent – doing new things as part of macro shifts from private to social, west to east, products to ecosystems, manual processes to automation and medicinal cure to genetic prevention, in a way that touches and changes our lives for the better. Arguably, the perception strength of these companies for those that know them – often in inverse proportion to their low levels of general public awareness – is a bellwether for the corporate forces that will come to dominate the 21st century, and hints at those organizations which will become household names for future generations of consumers, employees, shareholders and communities around the world. If their equivalent companies in 1915 were beginning to tame the physical world around us, these organizations have turned their attention to human potential – helping people to communicate, work, build relationships, innovate and challenge the limitations of organic life on an unprecedented scale in a way that is increasing our potential exponentially, not iteratively. This year’s FutureBrand Index captures the perception strength of these organizations around the world to reaffirm the main findings from 2014, but also to look ahead at the drivers of future success that might help us to map the next 85 years and beyond. The FutureBrand Index is a global perception study of the PwC Global Top 100 Companies by Market Capitalisation. Now in its second year, it assesses the gap between perception strength and financial size across a series of key measures of a ‘future brand’ to predict which of the world’s largest organizations are most future proof. In 2014 the FutureBrand Index demonstrated that financial value does not always correlate to perception strength of the world’s largest companies. And that the ‘cap gap’ – or gap between market capitalization and perceptions – varies by company and sector. Not just that, but when a PwC top 100 company enjoys above average global perception strength across our measures of a ‘future brand’, it has a measurable competitive advantage: in that more people are prepared to buy from, pay more and work for it. This helped us to broaden our understanding of ‘value’ beyond pure financial criteria, to include how far a company is seen to address why it is here, and the experience it delivers to people. But it was also to establish a benchmark before we reached 2015, so that we could begin to chart trends in perception strength that help to predict which companies and categories will come to dominate the public imagination in the 21st century. Continue reading to learn out more about those trends and this year’s research findings. Future brands balance what people want with what they need. How far is your organization seen to address why it is here and the experience it delivers? If you would like to assess how prepared your organization is for the future, please get in touch.